The greens were like lightning, the land forms were massive and rolling, the wind was blowing about 30 mph. In other words, it was just another day on the Plantation Course at Kapalua. I played my worst round of the trip, and yet I walked off the final green smiling. Hey, how often do you get to three-putt for par? 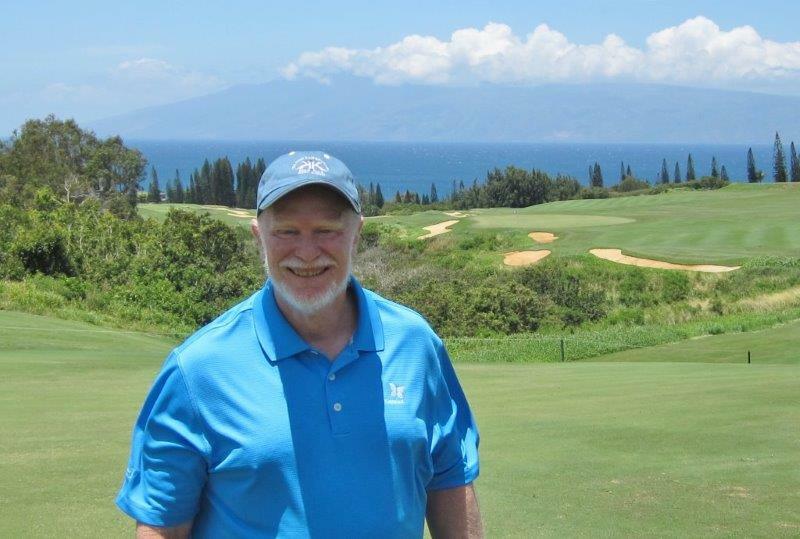 Three-putting was the name of the game for me today—nine out of 18!– and yet I don’t think I was putting too badly on this classic Bill Coore-Ben Crenshaw design. The mostly massive and slick greens were just that tough, with the wind playing its significant role. The eighth at the Plantation Course. Getting on in reg is only the beginning. Fellow Warrior Brian McCallen and I were playing in an agreeable foursome with Scott Robison, director of sales and marketing for our hosts at the Ritz-Carlton, and Ben Hongo, the director of instruction at the Kapalua Golf Academy. Both were able to give us useful local knowledge, and one can use all the help available on this course. It’s nice to know during the round that the grounds have been well-trodden by many a winner of the PGA Tour, which plays its opening tournament here each year. 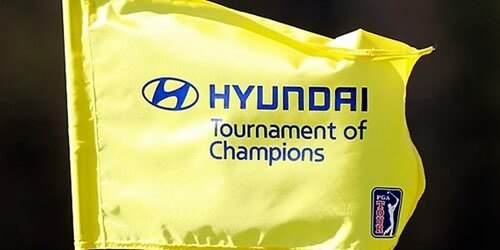 The Hyundai Tournament of Champions is open only to winners from the previous season, but is a wide-open resort course the rest of the year. However, only amateurs with a death wish would play from the 7,411-yard Championship tees. We wisely chose the Regular and Resort Combo tees—an up and back teeing pattern easy to figure out on the useful scorecard. (The course is managed by Troon Golf.) It worked out to a 6,330-yard march to a still-hefty 132 slope, all the challenge we needed and then some. On the very first hole I hit a decent drive that went over a slight rise, but when I arrived at my ball found it had rolled hard right and just inches from some hazardous cabbage. And so it goes throughout, the land heaves mimicking the ocean swells of the nearby Pacific, and the target rarely the middle of the fairway or the flag. It’s all about following the flow of the holes and trying to figure out which way the approaches will take your shots. I didn’t know how lucky I was two-putting on the first hole, until three-putting from three feet on the second. “Yeah, this is about average,” Ben said, when I asked him if the wind was always this strong. Getting ready to blast one onto the eighteenth green for an eagle putt. What the wind taketh away, it also giveth. I almost drove the green on the 328-yard par-4 twelfth (if only that pesky bunker 273 yards out hadn’t gotten in the way). But the big payoff came on the home hole, the notorious par-5 eighteenth, which plays from 663 yards for the pros, who are regularly gunning for the green in two anyway. That’s because the hole normally plays downwind, and if the drive makes it over the crest of a hill it will roll a long ways and down to the left. Then one merely need negotiate a downhill, side hill lie and sail over deep vegetation to have a shot at hitting the green. We teed it up from 538 yards and I nutted the drive. Then I nutted a three-wood that landed about 25 yards right of the green and tacked due left onto the surface. Easy three-putt par from there. 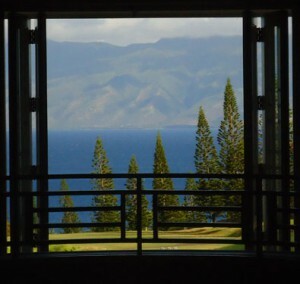 There’s a lot to contend with at the Plantation, and it can wear you out. But it’s a fair blend of endurance and exhilaration. 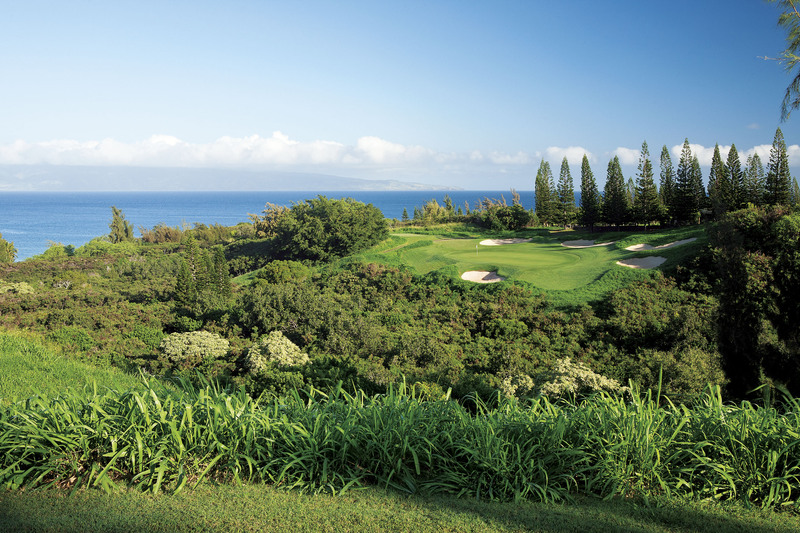 Even while the golf tests and teases, the scenery is a big-sky panorama of unfolding island splendor. 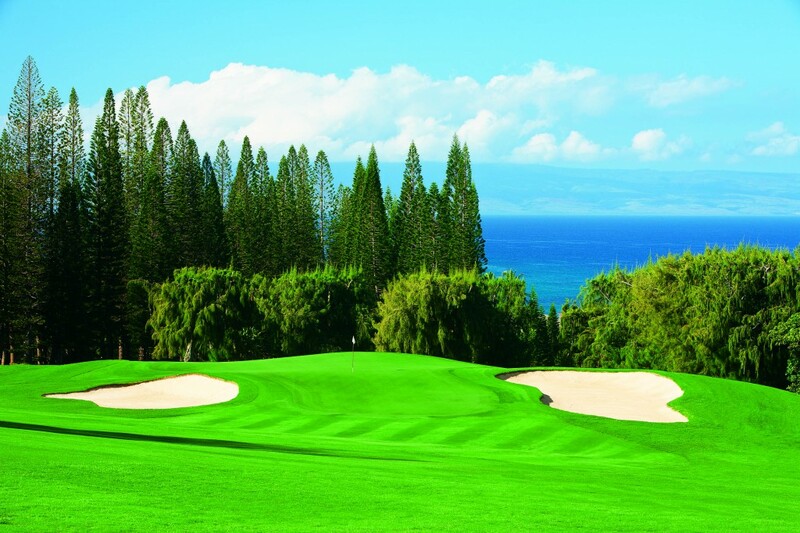 There’s truth in saying that the courses in Maui play among such beautiful settings that how you’re playing becomes almost secondary. That seems particularly true at the Plantation Course. But the “almost” sure makes me want to have at it again. My sole complaint was that I was too tired after the round to take advantage of the optional round on the Plantation Course’s predecessor, the Arnold Palmer-Francis Duane-designed Bay Course, an easier but also ingratiating track.